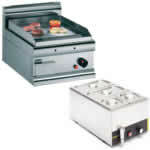 The right cooking equipment is vital to any professional catering or mobile catering business. Catering equipment that is manufactured to endure the rigours of a busy kitchen and a heavy workload is an asset to any food business. This is why at MobCater we provide a selection of professional cooking equipment designed for this very purpose. With top catering brands such as Samsung, Lincat, Buffalo, Parry, Thor, Polar, Fracino, Dometic and many more, we aim to provide your food business with the best possible choice and selection of commercial cooking equipment. So whether you need the latest equipment to kit out a new kitchen, need to replace an existing item or need a more specialised range of mobile catering cooking equipment – do browse the categories below.